How Does Kaz Headrest Stack Up? The best airline travel pillow! There's nothing like a Kaz Headrest! 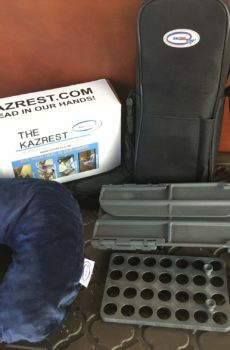 Its easy for anyone to take the Kaz Headrest with them on the plane using the special carrying case or in their carry-on bag. The headrest is lightweight, easy to use, very sturdy and weighs less than 2 pounds. Having trouble sleeping on the red eye? Sink into the luxuriousness of our front facing, plush pillow and sleep the flight away. Try a Kaz Headrest and rest comfortably on your next non-stop flight. You'll love it! Our Amazon reviews are extremely positive. International flyers really give the Kaz Headrest two thumbs up. The versatility of the Kaz Headrest gets a big plus for everything from holding laptops to recovering from surgery. The Kaz Headrest folds up tight and compact, so that it is easy to carry. This travel headrest doesn't take up too much space, and can be easily stowed away in your carry-on bag or under the seat while not in use. Short or tall, anyone can comfortably use the Kaz Headrest. This travel headrest can adjust to just about any height and comes with a plush, inflatable neck pillow. No more hunching over to catch a few Z's on your next flight! The Kaz Headrest comes with an inflatable neck pillow that features a plush, washable cover. Easily adjusted, our neck pillow fits on the headrest stand and lets you breath and sleep comfortably. Arrive rested for a change. Kaz Headrest is the world’s first portable, front supporting airline travel pillow. The headrest is fully adjustable, extremely comfortable, and can be used in airplanes, hotels, at the office and at home. Our travel headrest’s patented design makes it simple and easy to use. If resting on an airplane is difficult for you, then try a Kaz Headrest! 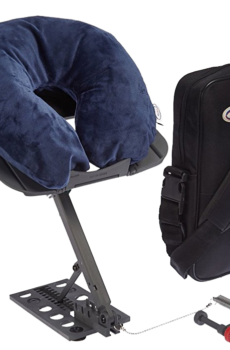 The Kaz Headrest airline travel pillow gives you the maximum comfort and rest you deserve while you travel. Kaz Headrest – The most comfortable travel headrest available today! Having trouble sleeping on the red eye? Sink into the luxuriousness of our front facing, plush pillow and sleep the flight away. Try a Kaz Headrest and rest comfortably on your next non-stop flight. You’ll love it! Try a Kaz Headrest on your next trip! Finally! Thank God! I had 40 hours of flights and layovers on my trip to Thailand last month and was unable to sleep. I completely crashed my immune system. I arrived sick, and remained sick for the entire 3 and a half weeks! I have tried all of the travel pillows known to man. Finally someone has taken the time and effort to design a complete system to be able to sleep in those micro economy seats. Attaching to the seat tray, it allows you to rest face down, while still being able to breath freely. The Kaz headrest is well thought out, and designed. It is very well made, yet it still weighs under 2 pounds. Sure it is a little pricey, but take it from someone who knows-it much cheaper than a trip to a foreign hospital and a ruined trip that I planned for a year! Its going on every trip I make from now on! This kaz headrest is indeed the best one on the market I tried several different types of headrest and none of them was even close to Kaz headrest. I recently took a trip from Hawaii to Los Angeles and for the first time I felt totally relaxed .Because headrest supports your head in the perfect position,I was able to nap the whole five hour flight. Yesterday my wife had a pain in her shoulder and upper neck and we used kazheadrest as a perfect position to massage.She was amazed how relaxed she was during the massage on the kazheadrest. This unit is indeed designed for multiple use in multiple location.It is very simple to use. I fly often for work and always dread the trip. Never arriving relaxed, always tired and frustrated from being cramped up for so long. When I finally saw somebody came out with the perfect companion for travel I jumped on it! I have never felt so much comfort in a flight or so rested...ever! The simple set up was easy to use and extremely comfortable. The plush softness of the pillow made me melt into a deep sleep, before I knew it I had arrived at my destination! The support it offers to my back and neck was heavenly as I deal with minor pains associated with life. Aside from the travel intention of the Kaz Headrest, I used it in the office to rest my head during long reads and research. HUGE GAME CHANGER! Using it in the office setting when I no longer want to be sedentary and sitting, I simply prop it up and begin to use in a standing position! By far one of my favorite design aspects of the Kaz Headrest!! The innovation and design is sleek, business friendly and easy to set up, wherever I need! Definitely a must have, I cannot wait to discover all the other uses from this versatile amazing product! !